For many people, prescription medications of various types are a beneficial part of their daily routine. But there is a limited shelf life for these drugs, and proper disposal is a way to manage both prescription drug abuse, as well as water quality and safety. 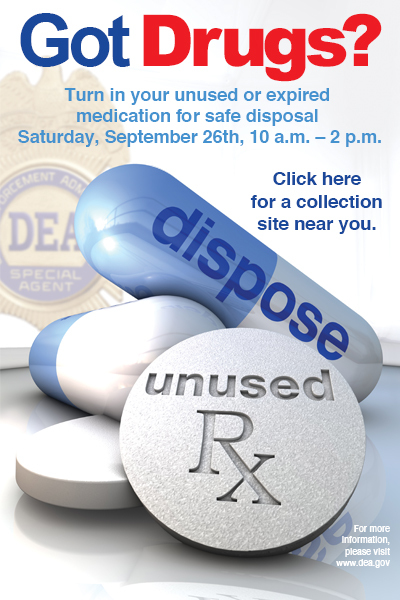 On September 26 from 10 a.m. to 2 p.m. the Drug Enforcement Administration (DEA) is giving the public its tenth opportunity in five years to prevent pill abuse and theft by ridding their homes of potentially dangerous expired, unused, and unwanted prescription drugs. Be sure to read about the program exclusions (liquids, patches, etc.). The service is free and anonymous, no questions asked. Taking care of disposal in this manner helps the environment and our collective water supplies, because if people dispose of medications (their own or their pets’) either by flushing them down the toilet or throwing them in the garbage, they can end up in our water systems or potentially make their way into ground and surface water as they decompose. Take unused or expired prescription drugs out of their original containers. Mix prescription drugs with an undesirable substance, such as used coffee grounds, cat litter, or vegetable oil. Put the mixture in a disposable container with a lid, such as an empty milk carton or sealed bag. Conceal or remove personal information from the original drug container, including Rx number, by covering it with permanent marker or duct tape, or by scratching it off. This initiative addresses a vital public safety and public health issue due to misuse and abuse of prescription drugs, and keeping water supplies free of pharmaceuticals. We can all take steps to improve the condition of our natural surroundings through proper disposal of pharmaceuticals. Protecting our family, friends, and water supplies is a collaborative effort shared by us all.